These Mustard Brussels Sprouts are perfect for any holiday or dinner table. Maple syrup and Dijon mustard bring out the flavors in the vegetable and the toasted pecans add a delicious crunch. They’re so easy to make and ready in less than 15 minutes! Growing up, holiday meals with my extended family always had the same exact food. Besides the main, we had canned green beans, boxed stuffing, mashed potatoes, and gravy. It tasted good (especially coming from my house where no one cooked) but I now find it fun to try new things and to make things as healthy and tasty as possible. 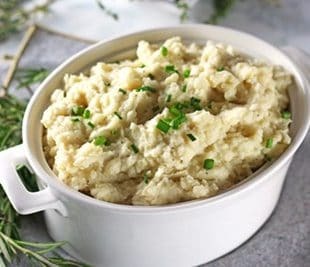 I have already healthified the mashed potatoes and gravy (yum!) so now I’m working on other sides for my holiday meals. 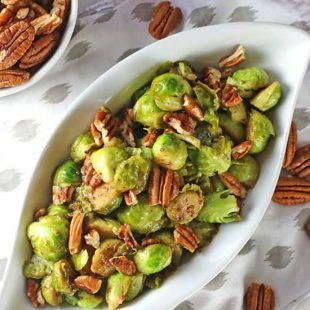 While I want to recreate a green bean dish, I have been learning how healthy cruciferous veggies like Brussels sprouts can be so I’m switching things up and adding these to my Thanksgiving and holiday table. Bring on the Brussels Sprouts! Brussels sprouts get a bum rap but I guess sometimes, with good reason. If they’re boiled with no seasonings there is no way they are going to taste good. Side Note: I usually refrain from boiling most vegetables (except maybe potatoes) for taste and as well as health reasons. Did you know that boiling releases many vitamins and minerals from vegetables into the cooking water? The nutrients will be lost if you’re not also drinking the water they are cooked in (soup is different because we drink that liquid). Back to Brussels sprouts…I love the taste of Brussels sprouts if they’re cooked correctly. I often roast them with some olive oil, salt, and pepper but cooking them in a pan like I do with these is also very easy. Plus when you top them with a tasty sauce – they’re totally delicious! Seriously they are, try them for yourself and see! As I said I usually like to roast vegetables but during the holidays the oven might be taken up by other things (such as these tasty Lentil Puff Pastry Pockets). So to make things easier and quicker, I cut the Brussels sprouts into halves or quarters (depending on how big they are) and cook them in a pan. Maple Mustard Brussels Sprouts make the perfect side dish. Speaking of side dishes, those are another things that do not always get the respect they deserve. 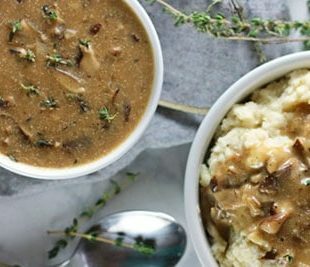 As a nutritionist, I know how important sides can be (both health and taste wise). You don’t want to ruin a healthy plate by adding some sad processed side dish. 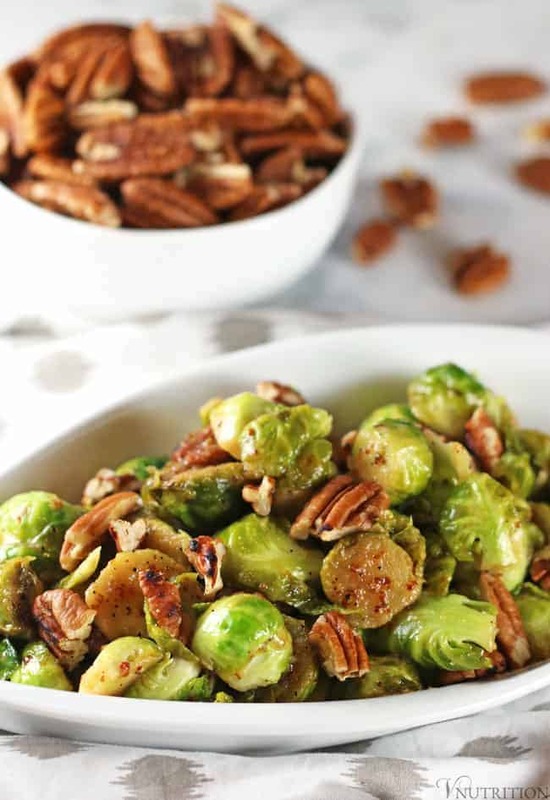 If you make this Maple Mustard Brussels Sprouts recipe, let me know what you think by ★ star rating it and leaving a comment below. These Mustard Brussels Sprouts are perfect for any holiday or dinner table. Maple syrup and Dijon mustard bring out the flavors in the vegetable and the toasted pecans add a delicious crunch. They're so easy to make and ready in less than 15 minutes! 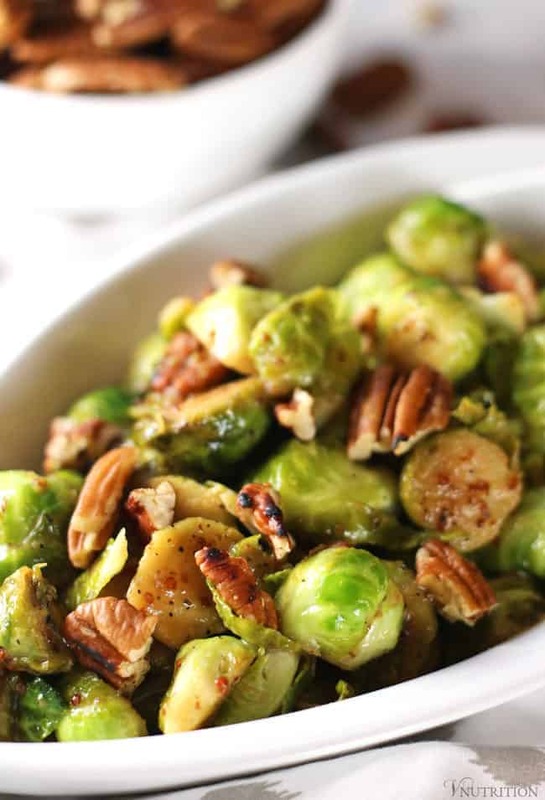 Add Brussels sprouts, olive oil, salt, and pepper in a pan and cook for 5-7 minutes or until Brussels sprouts are tender. Add maple syrup, mustard, apple cider vinegar, and garlic powder into pan and cook for another 2-3 minutes. Meanwhile, toast pecans in a separate pan for 1-2 minutes to release their flavor. 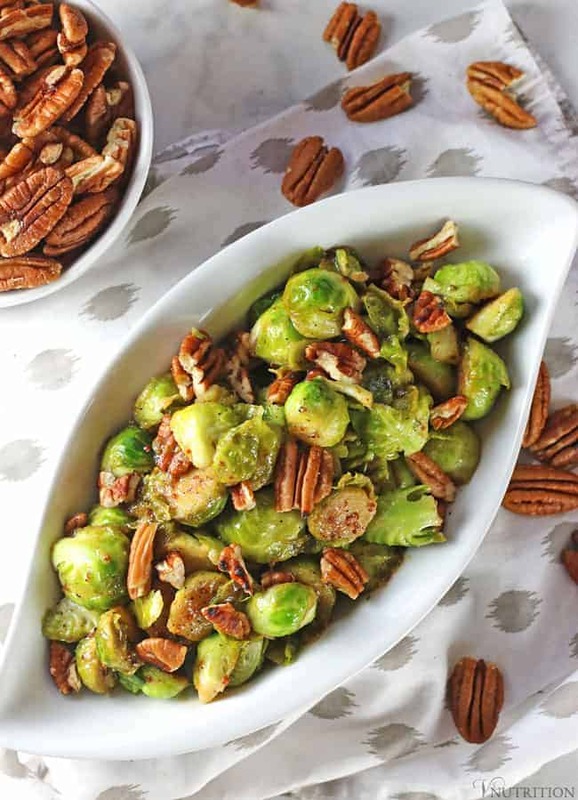 Add Brussels sprouts to serving dish and top with pecans. Oh my gosh, these look fabulous! I love Brussels sprouts and am always looking for ways to get my family to love them as much as I do. I’m going to try this recipe on them, since they have been fans of so many other recipes from your site! 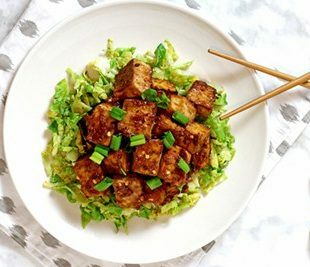 These do sound amazing, I am such a fan of brussels sprouts and always looking for ways for hubby to enjoy them more too. Thanks!